The Bauer VAPOR X900 chest protector allows goalies to make quick, agile saves while offering superior protection. 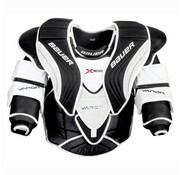 The fast strap allows the goalie to tighten the chest and arm on the body for the most balanced fit. The Free Flex edge on shoulder floaters offers greater mobility to block top-shelf shots and the THERMO MAX liner adds a higher level of comfort.